We hung out at Central Perk 7 in Kharghar and we’re totally in awe of how they’ve recreated the magic of our favourite sitcom! 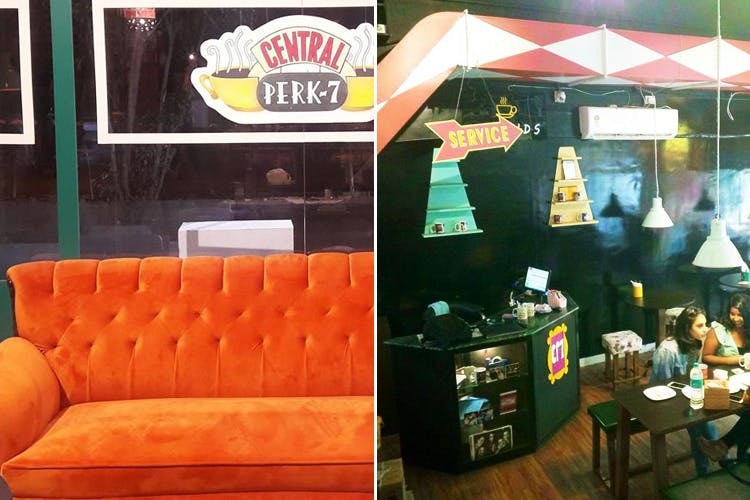 Inspired by the mother of all sitcoms F.R.I.E.N.D.S, Central Perk 7 at Kharghar is a replica of the famous coffee shop in the show. The place has some amazing wall decor that depicts scenes from the series. They even have the big, mushy orange couch and the Joey-Chandler foosball table. It’s the perfect place to hangout with your gang, and doubly so if any one of you is a die-hard F.R.I.E.N.D.S fan. The place has pretty good vibes just like the happy feelings you get while watching F.R.I.E.N.D.S., and the friendly staff just makes it better. The BBQ Chicken Pitara is one of the popular choices here - a tender chicken patty placed snugly between two pita breads, it is a reminiscence of a delightfully delectable sandwich pizza. Do try the very refreshing Guava Slush to wash it all down. Your day can't get any better if you're at this F.R.I.E.N.D.S cafe. Get your gang together. And if you look deeper, there is a Monica, a Phoebe, a Chandler, a Joey, a Ross and a Rachel right there. Tag them, and let them know!